Students smell plants and group those that smell similar. Then they find out what smell molecules they have in common, which can explain why they smell similar. Different smell molecules activate a different combination of smell receptors, and so send a different pattern of neuron impulses to the brain, which are interpreted as different smells. Best if students are sitting in a circle. Explain to students that they will smell plants and compare their smells to map which smell molecules they have in common. 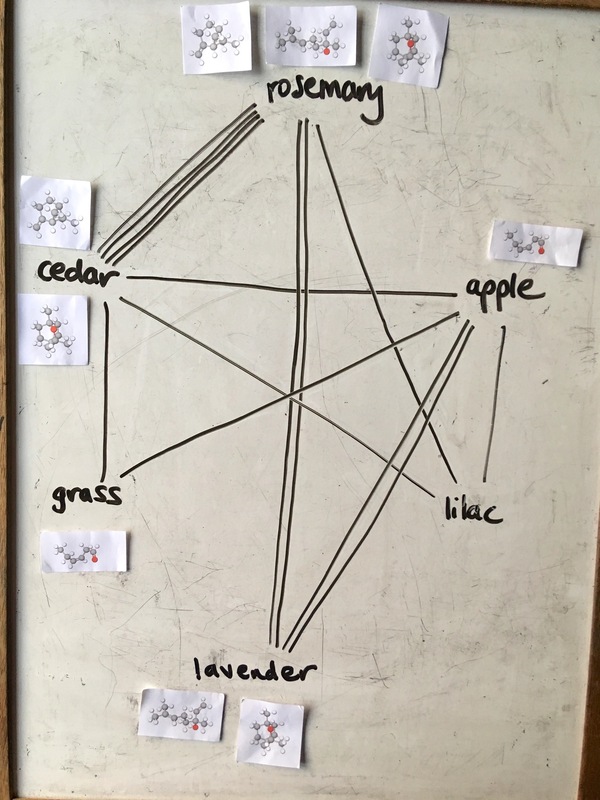 Write the names of the plants to be smelled in a circle on the board. 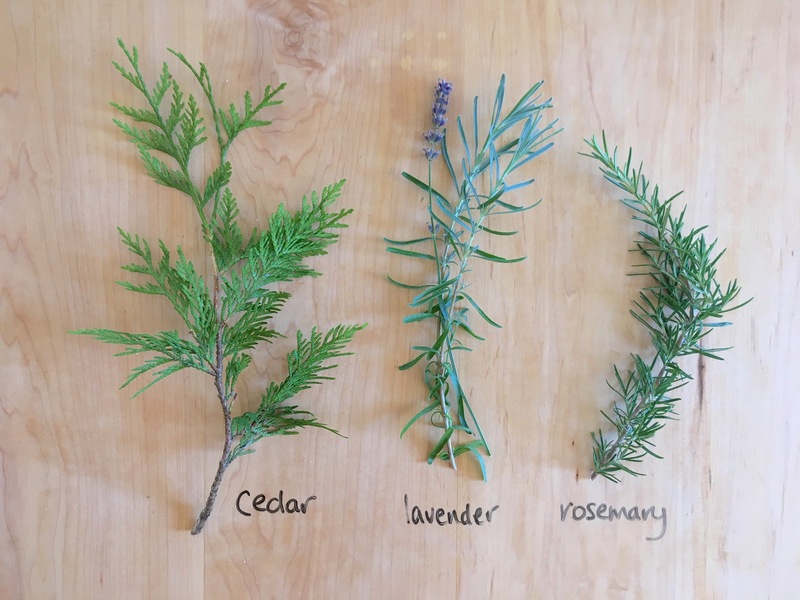 I used cedar, rosemary, lavender, grass, a green apple (cut open) and a sweet-smelling flower (e.g. lilac). Pass the plants around the circle, and ask the students to smell them all. They can rub the leaves between their fingers to release the smell molecules if necessary. Students should compare the plant smells, and tell you which ones smell similar. They will want to discuss what they smell, and it is almost certain that different students have different opinions about which plants smell similar - this is fine, as smell is a complex sense and everyone smells things a little differently. For each student that finds two plants that smell similar, draw a line between their names on the board. So if many students match up two plants they will have many lines between them, and plants that fewer, or no students, find a similarity between will have few, or no, lines joining them. Once the board has many lines on it, explain to students that the reason some plants smelled similar to them is because they release the same smell molecules. Find a pair of plants that students matched up, and attach the pictures of the smell molecules they have in common next to the relevant plant names (refer to the list below). 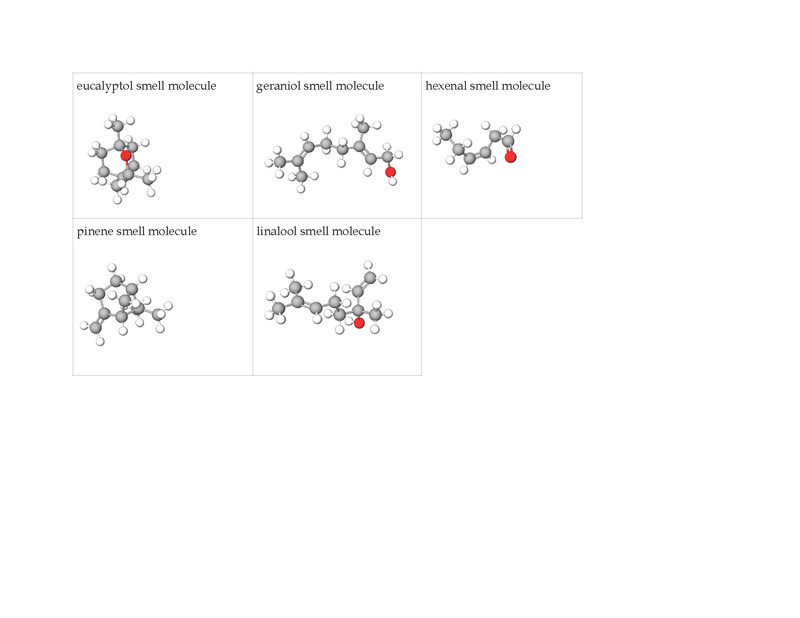 Make sure that students can see the molecule pictures and that they are repeated next to plants that smell similar. 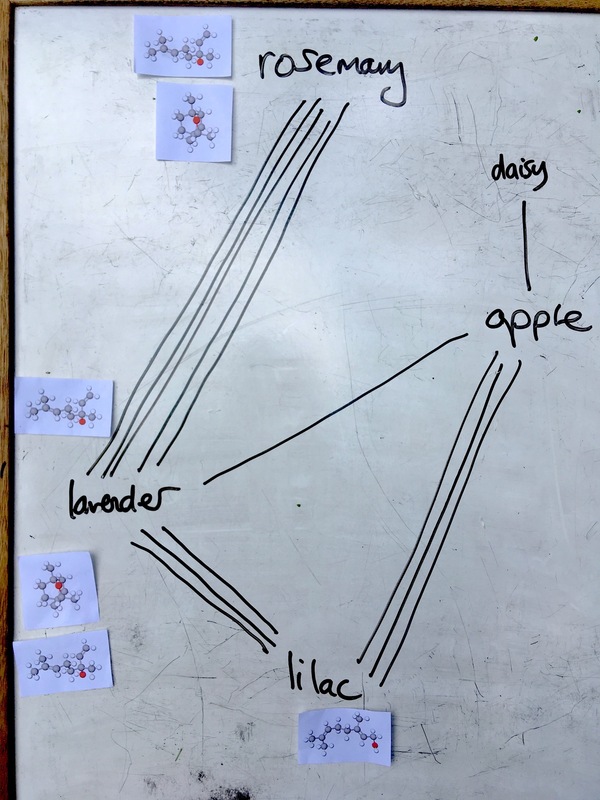 Only post the molecules of plants that students have matched. If students match plants that there are no common smell molecules listed for, discuss that they likely do give off the same smell molecules, but you don't have the images for them - smells are made up of many molecule types, and we are only looking at some of them here. Discuss why students make different matches: each of us smells a little differently, so we will pick up on different smell molecules in the plants and make different matches. Eucalyptol molecules are in cedar, lavender and rosemary smell. Pinene molecules are in cedar and rosemary smell (also pine and other coniferous trees). Hexenal molecules are in grass and green apple smell (it is released when grass or green leaves are damaged). Geraniol molecules are in lavender and sweet-smelling flowers (geranium, rose etc). Linalool molecules are in rosemary, lavender, sweet-smelling flowers (also some herbs e.g. coriander). Final discussion on smell and how it often triggers memories. We each have our own associations with them, depending on our experiences as we grow up. Students can share any smell memories.